As most river runners know you can never have too many straps or carabiners. 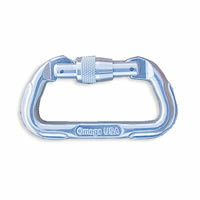 These top quality climbing carabiners have many uses but are a must for setting up any kind of river rescue. We recommend your "wrap kit" to include at least six carabiners. The Locking D Carabiner features a threaded sleeve that locks the gate closed to prevent it from opening. If you plan to wear any carabiners on your PFD make sure that they are locking - this will keep you from accidentally clipping yourself into your gear in a rescue situation.